Dr. Robert Beck discusses the blood electrification device that he sifted from obscurity and almost lost due to the media blackout. 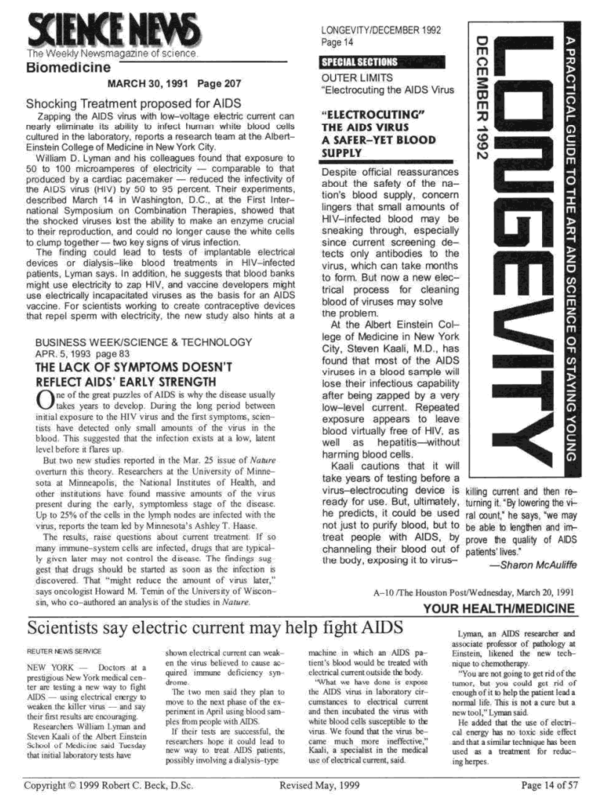 Science News 1991 article about Blood Electrification. A new process and system for treatment of blood and/or other body fluids and/or synthetic fluids from a donor to a recipient or storage receptacle or in a recycling system using novel electrically conductive treatment vessels for treating blood and/or other body fluids and/or synthetic fluids with electric field forces of appropriate electric field strength to provide electric current flow through the blood or other body fluids at a magnitude that is biologically compatible but is sufficient to render the bacteria, virus, and/or fungus ineffective to infect normally healthy cells while maintaining the biological usefulness of the blood or other fluids. For this purpose the low voltage electric potentials applied to the treatment vessel should be of the order of from about 0.2 to 12 volts and should produce current flow densities in the blood or other fluids of from one microampere per square millimeter of electrode area exposed to the fluid being treated to about two milliamperes per square millimeter. Treatment time within this range of parameters may range for a period of time from about one minute to about 12 minutes. Build your own Blood Electrification machine! : The Beck Blood Electrifier Schematic and Parts List. Download your free PDF of Dr. Bob Becks Lecture which explains how to build your own Blood Electrification devices and Colloidal Silver makers. Important Disclaimer: Electro Biotics is engaged in the dissemination of general health related information only. We do not under any circumstances offer medical advice. Nothing on this page or site should be construed as representing medical advice on the treatment or diagnosis of any condition giving a cause for concern, or be used as a substitution for such. If you have any symptoms which give cause for concern you should consult your physician or other health care professional.